In a newly released strategy, the United States has proposed an increased global effort to locate 300,000 or so Earth-impact risks and prepare for potential future meteor collisions that could destroy cities, civilization, or all life as we know it. Near Earth Objects (NEOs) are defined as asteroids or comets that come near our planet’s orbit. 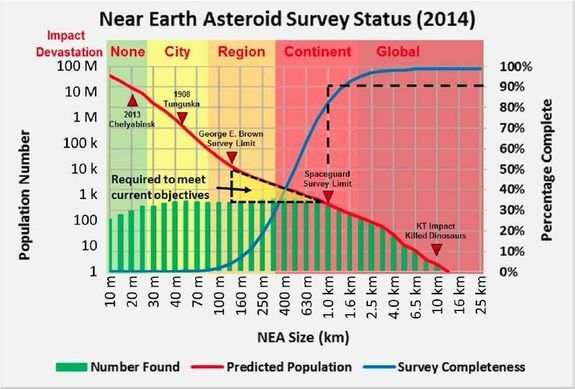 A newly published White House document entitled ‘National Near-Earth Object Preparedness Strategy’ details how low-probability, high consequence impacts pose a “significant and complex challenge”. Cataloging and tracking these things is no small task. As of December 2016, we know for sure of some 15,342 NEOs between 1 meter and 32 kilometers in diameter. The current estimate is that there are about a thousand out there larger than a kilometer wide, and about 13,000 that are more than 140 meters across – real killers, each with their own speed, direction and orbits through the galaxy. After two decades of searching, only about 28 percent of the estimated total number of NEOs bigger than 140 meters across have been found and tracked. That's far short of the 90 percent that US Congress directed NASA to get a handle on by 2020, and it leaves a global blind spot of more than 9,000 potential extinction-level threats that we could potentially do something about if we gave ourselves enough warning. In 2013, a meteor broke apart over Russia, sparking panic and injuring over 1,400 people. Called the “Chelyabinsk Event,” the culprit meteor was estimated to be around 17-20 m (56-65 ft) in diameter and released approximately 500 kilotons of energy. (additional video compilation) The Chelyabinsk meteor exploded about 30 kilometers above the Earth's surface like a 500-kiloton bomb, releasing nearly 30 times more energy than the Hiroshima atom bomb over a small Russian city. It hospitalized 1,500 people. Back in 1903, the famous Tunguska impact happened, again over Russia although thankfully in a sparsely populated area. The Tunguska meteor was a little over 60 meters wide detonated over a forested area, flattening 80 million trees across some 2,000 square miles of forest. The blast shock, it's estimated, would have measured 5.0 on the Richter scale. The alarming fact is that those two strikes were almost insignificant. In the last 10,000 years (the span of time greater than that of recorded human history), our planet been hit by at least 8 asteroids that left impact craters more than 100 meters across, including one in Argentina with a 4.5 kilometer diameter. While our atmosphere protects us from a tiny fraction of potential NEOs, there is a profound reality that we live in a shooting gallery with bullets the size of planes, office buildings, and mountains! Any one of which can turn huge swaths of land into a lakes of fire and molten rock. No "prepper" planning any individual family or community can do can protect against a mountain falling from the sky. Every year, dozens (or more) of interstellar objects like comets and asteroids come very close to Earth. In fact, as of January 3, 2016, 15,420 NEOs had been discovered. On March 21, 2016, an NEO under one lunar distance (1LD) from Earth was estimated to be upwards near 86 m (282.1 ft) in diameter. If that object had broken through the atmosphere and landed on Earth, the damage and devastation would be immense. Even more threatening is the danger of asteroid 2013 TV135 impacting the Earth. This asteroid has only a 1 in 63,000 chance of impacting within the next 100 years, but if it does, it would be absolutely catastrophic. The asteroid measures in at about 400 m (1,300 ft), which is only 4% of the size of the asteroid that is said to have killed the dinosaurs. While astroid 2013 TV135 poses little risk of ending all life as we know it, the impact would bring with it approximately 50 megatons (nearly 3000 times the devestation potential of a Hiroshima-like atomic bomb). Such an impact would certainly be an event of planetary porportions, risking entire communities, cultures and altering the course of human events across the globe. 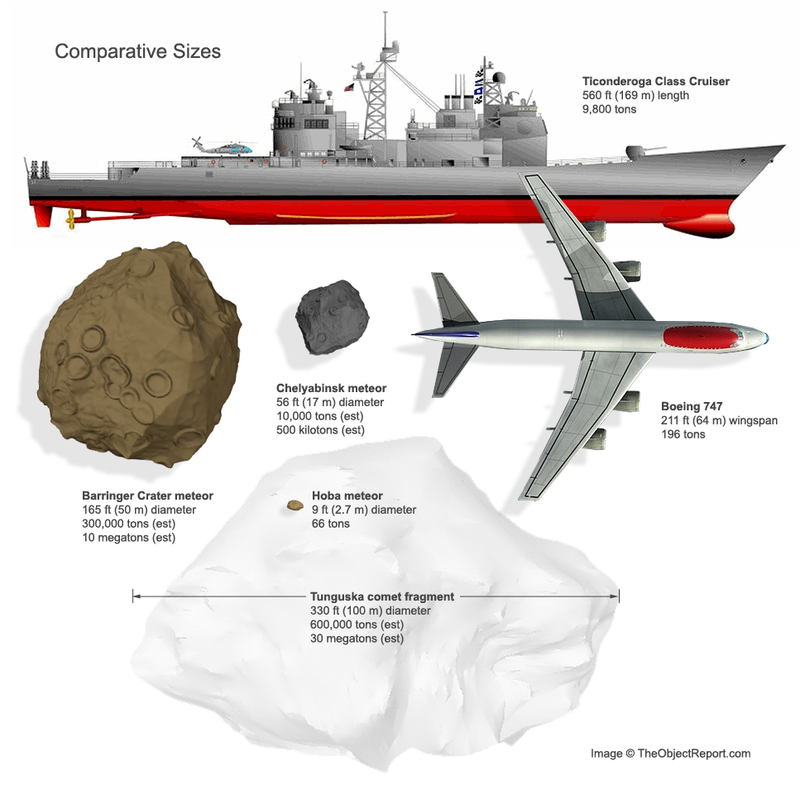 A size comparison of some of the more notable objects to strike the Earth in the last 50,000 years or so. It is important to understand, while this is a national security interest, it is also very much in the interests of humanity and the future of human existance. The United States government is not taking the possibility of an asteroid impact lightly. In January of 2016, NASA joined with US defense and research agencies to form the Detecting and Mitigating the Impact of Earth-bound NEOs (DAMIEN) group. This group released a report detailing its strategy for dealing with NEOs. Within the report, this group outlines seven strategic goals that they will use to help mitigate the risks of a possible asteroid impact. Enhance NEO Detection, Tracking, and Characterization Capabilities -- Objectives include: developing a capability roadmap to inform a strategy for investing in both U.S. and foreign abilities for detection, tracking and characterization; improving observation capabilities for more complete and rapid observation of the entire population of NEOs; and updating existing observatories with capabilities to improve characterization assessments. Develop Methods for NEO Deflection and Disruption -- Objectives include: developing capabilities for fast-response, focused reconnaissance and characterization; researching deflection and disruption capabilities for NEOs of varying size, mass, composition and impact warning times; and researching technologies required for deflection and disruption concepts. Improve Modeling, Predictions, and Information Integration -- Objectives include: ensuring that adequate modeling capabilities are developed for each topical need, especially for modeling NEO trajectories to reduce orbit uncertainties and predicted impact effects; determining what outputs are required by whom; and establishing an organizational construct to coordinate the development and dissemination of modeling results. Develop Emergency Procedures for NEO Impact Scenarios -- Objectives include: promoting a collaborative national approach to defend against, mitigate, respond to, and recover from a NEO impact event; and developing coherent national and international communication strategies to facilitate NEO impact preparations. Establish NEO Impact Response and Recovery Procedures -- Objectives include: establishing national and international protocols to efficiently respond to a NEO impact, whether in deep ocean, coastal regions or on land; and facilitating international cooperation and planning to recover from a NEO impact in a timely manner with minimal disruption. Leverage and Support International Cooperation -- Objectives include: building international support and policies for acknowledging and addressing the potential Earth impact of a NEO as a global challenge; fostering consultation, coordination and cooperation channels and efforts for the planning for, impact emergency preparedness before, and response to a NEO impact; increasing engagement with the international community on observation infrastructure, data sharing, numerical modeling and scientific research; strengthening international coordination and cooperation on NEO data and National Near-Earth Object Preparedness Strategy analyses; and promoting a collaborative international approach to preparedness for NEO events. Establish Coordination and Communications Protocols and Thresholds for Taking Action -- Objectives include: coordinating the communication of detected impact threats within the U.S. Government, as well as with other governments, media and the public; developing a set of thresholds to aid U.S. decisions in whether to implement deflection or disruption missions; developing decision flowcharts for NEO hazard scenarios incorporating benchmarks and decision thresholds; and developing protocols for international interactions regarding NEO impacts outside of U.S. territory." This is obviously a tricky problem in terms of funding. The potential consequences of a decent sized asteroid hit are enormous ... just ask the dinosaurs, who, it's believed, were wiped out by a 10-kilometer wide rock impact that, according to a report by NPR, briefly made the Earth's surface act like a liquid, flinging up a "splash" of rock from as much as six miles below the surface. On the other hand, the chances of it happening in a given political term are very low. So it's good to know the folks in charge are at least taking this sort of thing seriously. However, we must be determined. Strategies are nice and necessary, but plans must translate into action. At present, the only plans currently in action for a space-based NEO telescope are being carried out by the non-profit B612 foundation whose Sentinel telescope was supposed to launch last December, but has been delayed due to difficulties securing the requisite $450 million in funding required for the project. Our civilization is now truly global in scale and scope, and it behooves us to comport ourselves accordingly and take cognizance of all the potential threats to our survival—whether destructive wars, disease pandemics, climatic change, or the threat of extraterrestrial impactors. Hopefully, the survival of humanity will not be threatened by the impact of an NEO anytime soon; but if it is, we can rest a little easier knowing that measures are being taken and there is finally a sound plan in place.